Apple used its Back to the Mac media event back in October to unleash a new version of the iLife software - as well as the new MacBook Air. iLife '11 features a new and improved version of the iPhoto app, which includes full-screen view and the ability to share photos on Facebook and Flickr from within the app. 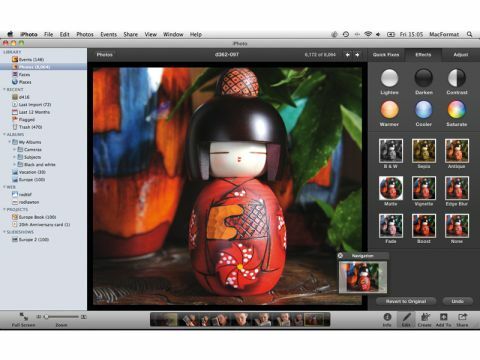 iPhoto can also pull in photos directly from your Facebook and Flickr feeds, which will live within the interface. There's also the new Places functionality which highlights geotagged photos on a map. The UI - which also includes a slideshow feature - has also been overhauled to look a little more like an iOS app than previous versions. Also part of iLife '11 is a new version of iMovie. The big news here is the inclusion of face detection technology which makes it easier to find movie frames featuring certain people from within your footage. There are also 15 new movie trailer pre-sets to allow amateur auteurs to compose the best possible advert for their new blockbuster. iMovie '11 also boasts a better audio editing experience to allow easier adjustments to audio levels and new "one-click" sound effects. Garage Band has also undergone a facelift, with a cool feature called "groove time" which brings all of the other instruments into time with the "star instruments", so if the guitars are out of time with the drums, you can fix that in one click. The new "How am I playing" feature will allow users to play along with real orchestras and receive feedback from Garage Band on their instrumental performance - kind of like a Guitar Hero for Garage Band. iWeb 3.0.2 and iDVD 7.1 are also included in iLife, but not reviewed separately here.